Eel Brook Common is common land in the London Borough of Hammersmith and Fulham, close to Fulham Broadway Tube Station, with its southern boundary on New Kings Road, Chelsea. According to the Fulham Society, the name actually is a derivative of 'hill brook common' - which relates to Musgrave Crescent, which is raised much higher than the surrounding land. It is believed that this is artificial and it probably was originally a Bronze Age mound - either a raised piece of ground to defend against attackers, or as a burial mound. When you leave Eel Brook Common from the north side, you go up a steep ramp - up onto Musgrave Crescent. The common is not particularly remarkable, but for the fact that in 1883 and 1891 a then local amateur football team, Fulham F.C., played their home games there. It usually hosts a circus in early summer - and has three other fairs there every year - including Carters Steam Fair. During WWII, an underground bunker was located under Eel Brook Common; this was to protect residents from the Luftwaffe- especially during the Blitz period. Hence why Eel Brook Common is unusually flat. During 2002/2003 Groundwork West London completed a £300,000 make-over of the Common, installing surfaced and fenced sports pitches, and revamping the vegetation there. In the year 2008/2009, Chelsea Football Club help create an astroturf pitch which can be used in the community. It was sponsored by Chelsea in association with Adidas and is in The Blue of Chelsea Football Club. Many local residents complained to the Council about the colour in a green environment, and so there has been much work to grow varied natural screening. The common can be accessed by many roads - including Effie Road to the north, Musgrave Crescent to the east and the New King's Road to the south. There are two tennis courts and a children's play ground primarily aimed at under-6s. Here's the our members favorite photos of "Recreational Areas near Hammersmith and Fulham". 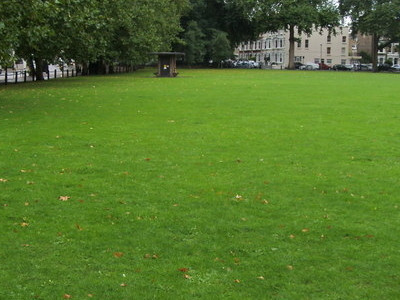 Upload your photo of Eel Brook Common!